Developed especially for hotels and restaurants, this cheese has a confirmed and highly-respected reputation. Its versatility stems from its ability to shine on pizza, in onion soup, in salads, and in endless other recipes. Upon opening the package, one gets a suspicion of its full potential, and that suspicion is confirmed when the first bite is taken. 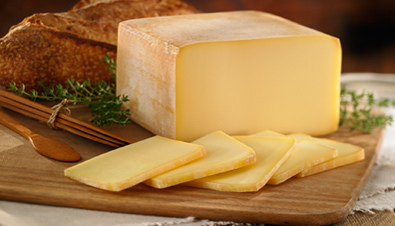 A surface-ripened, firm cheese, with a slightly sweet taste and a grilled-bread aroma, L’Arrière-cour is matured to perfection. Melt it over your recipes, shred it, grill it or use it in a fondue. Whatever your do, don’t underestimate its versatility!